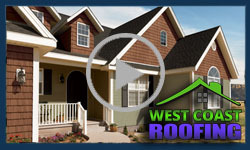 When it comes to hiring a West Linn roofing contractor, look no further than West Coast Roofing. We are a West Linn roofing contractor with the experience to provide you or our business quality roof repairs and installations throughout the West Linn area. Whether your roof needs a simple repair or a complete replacement, West Coast Roofing is the West Linn roofing contractor of choice. You can trust us to install your roof using the highest standards so that the lifespan of your roof is maximized and your home receives the fullest protection a roof can provide. When it comes to West Linn roofing contractors, no company in West Linn is as courteous and respectful. Unlike other West Linn roofing contractors, we make every effort to keep your property clean and we promise to do a thorough cleaning of any project related materials prior to our departure. West Coast Roofing is your one stop when it comes to choosing a West Linn roofing contractor, and we can help you with all of your West Linn roof repair and installation needs including gutters, painting, re-roofing, roof estimates, roof inspections, roof installations, roof repairs, roof replacements, skylights, and more. Are you looking for a high quality West Linn roofing contractor? Contact West Coast Roofing today and discover why we are West Linn's roofing contractor of choice!